How well are you doing to schedule the time and tickets that you will work on today? Tomorrow? The next 7 days? Do you have ‘past due’ activities on non-project tickets? Do you have tickets that may have ‘fallen through the cracks’ by being assigned to you but NOT designated to happen on a specific date? 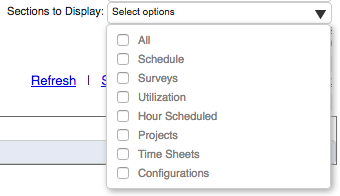 Our example screenshot does not show entries for this section, but this section provides survey feedback for each engineer over a variety of timeframes. What percentage of your time is spent on billable client work? Various timeframes are examined from ‘this week’ to ‘this year’. Looking at this week, how many hours do you already have ‘scheduled’ on your calendar, and how many hours are ‘free’? How many ‘open’ project tickets have you been assigned that are still ‘open’? Do you have project tickets assigned to you that do NOT have a ‘next action’ defined for them? (i.e. they may be ‘stalled’ or forgotten). Did you get your timesheet submitted ‘on time’ this week? What percentage of the time have you submitted them on time over the last 90 days? Year-to-date? How many configurations have you created this week? This month? This year? How many of those configurations have you ‘attached’ to tickets?